Emotion sounds played by Messenger Plus! are now played in stereo. This fixes problems caused by faulty hardware or drivers that do not handle mono sound files properly (resulting in incorrect playback or no playback at all). New feature: all scripts and skins can now be automatically updated! this will ensure you always get the benefits from the latest versions of the components you use without worrying about them. Almost all the current scripts and skins are supported by the system. Update check is done once a week, as usual, and you can force a manual check by using the /checkupdates command in any chat window. If an update is available, you will be notified once automatically. 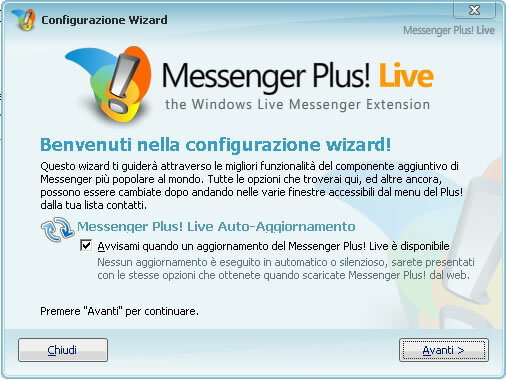 If you choose not to install a particular update, Messenger Plus! won’t prompt you about it anymore unless another update is available. This was done to remove the annoying factor of this kind of auto-update procedure. This feature may be used in the future to offer exclusive new scripts, skins and more for download. This will also help the distribution of minor updates using delta patches. Script and skin developers are encouraged to use the new UpdateId and BuildNumber information elements in their XML file to ensure proper future updates or their products (see updated documentation). Of course, all of this can be disabled in the preferences. New “panel size” option added for the Quick Icons panel. Use it to display more emoticons in each page of the panel. The (!VER) tag now correctly identifies Windows Server 2008. Double-clicking on a contact in the Contact List Clean-Up window now opens the Contact Information window. A new page has been added at the end of the Setup to confirm that installation was successful and to offer a link to download new skins. Security fix: mis-formated URLs saved in HTML chat logs can corrupt log files (fixed previously in build 326). The Interface Tester program now supports command line arguments (use -? for more details). External programs wanting to display a preview of Messenger Plus! windows may want to use this. Fixed: skin shapes are not always properly applied. Fixed: invalid skin packs may display an error message twice on import. Scripts: added <Size> element for RichStatic controls. Per il download, basta cliccare qui.